A cosy winter pub with the benefit of Samuel Smith Brewery prices. 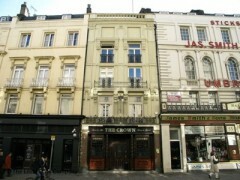 About: The Crown is a pub that serves a variety of beers, wines and spirits as well as a selection of traditional pub fare. Fruit machines are provided as part of the entertainment and seating on the terrace area is provided, weather permitting. "A cosy winter pub with the benefit of Samuel Smith Brewery prices." Before the pesky killjoys put a stop to the street drinks you could enjoy under the tree on the large plinth outside the Crown, this was one of the greatest pubs in Central London. Now? Not so much. Sure, people would buy beers from the newsagent across the road and mix with those more scrupulous with their drinking morals but that was part of what made the atmosphere. These days you’ll find the traditional pub decorated in the classic Samuel Smith Brewery style of dark wood, dim lighting, intimate drinking ‘cells’ and brewery inspired clutter. And while our gripe on the case of the lost fun outside only comes into play for the summer months (there is a cordoned off outdoor drinking area), during colder times there’s a lot to like about a cosy pub like this. If you’re a fan of Samuel Smith beers – and let’s face it, the price is always a factor – then you’ll be charmed by The Crown as you sink Alpine after Alpine after Alpine, paying around £10 for the pleasure of those three pints. Show us somewhere else in London that you can now get three pints for £10 and we suspect you’d be showing us a workingman’s club in some distant corner of Canning Town. Nothing wrong with that but why would we want to go all the way out to Canning Town when we’re on New Oxford Street? If you want a super-cosy, good-natured atmosphere to have a pint in around this area, choose the Cross Keys on Endell Street. But, if that’s too busy - and it often is - then you could do much worse than a few cheapies at The Crown. The drinks are really limited and it doesn't even have a great atmosphere which would encourage you to stay. The staff were incredibly rude and we were waiting a very long time to be served. We were there at an off-peak time and there were lots of staff on, so we didn't really understand the bad service. Definitely would not recommend. Maybe some friendlier people would be helpful. A brilliant pub with great food a lovely couple from Sheffield have it now. They are so friendly and it's a real fun place to go.The pub inside is like Sherlock Holmes house with beautiful furniture. The beer and lager are well looked after and really inexpensive. Hope this helps. A well run establishment which dispenses reasonably priced, if limited selection, drinks. All of the draft beer is from the Samuel Smith brewery. All of the liquor is of the same house brand, I don't remember the name. Best local pub around. I've met some of my best friends there. Don't go there, it gets too crowded - Especially Thursday night in London, which seems to be a happening night in general. Cheers! My favorite pub in London. Always full of fun people, great staff, and cozy atmosphere. The outdoor patio is also large and can accomodate large groups of people, so meeting with tons of friends is possible. Such a great place!